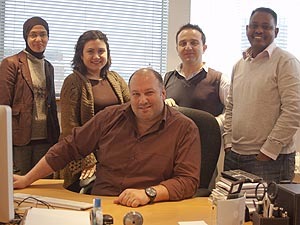 London: IHA launches new Arabic-speaking broadcast services department. IHA has launched a new Middle East and North Africa department to be headquartered at IHA’s London bureau. It will be led by Gurcan Sarisoy and his Arabic-speaking staff. Baris Soylu and Tahir Osman. Seated is Gurcan Sarisoy. The department will focus on marketing IHA’s broadcast services as well as news production and the distribution of IHA content. It will be the central hub for the co-ordination of all client enquiries from the Middle East and North Africa with respect to production, reporting and broadcast services. This includes but is not limited to the provision of reporters and live guests, the packaging of daily programmes and reports from any of IHA’s worldwide locations.